Unique Maritime Group, one of the world's leading integrated turnkey subsea and offshore solution providers, announced today that it has successfully completed an integrated meteorological-oceanographic system for Zakum Development Co (ZADCO), the Abu Dhabi-based oil and natural gas exploration and production firm, on and around Zirku Island. 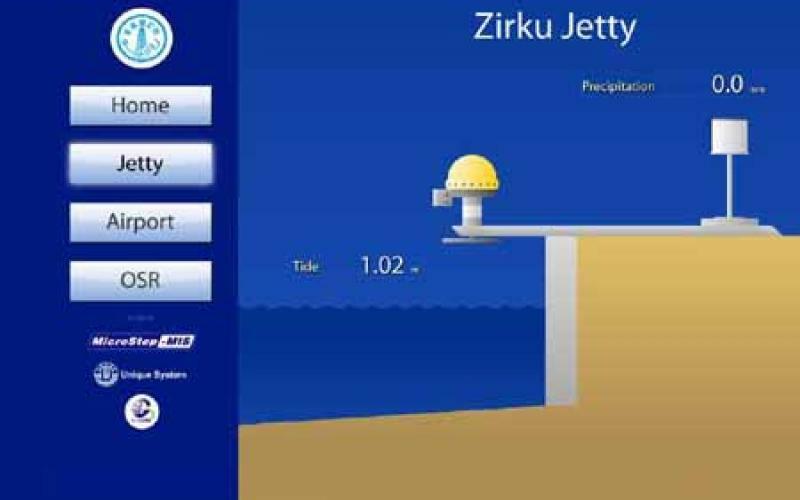 Automatic weather station at Zirku Jetty is equipped with microwave radar, installed at the end of Jetty which is 150m away from the jetty supervisor office and rain gauge sensor installed on the rooftop of the Jetty Supervisor office. The parameters measured at jetty station are precipitation, wave height, wave period and tide. This would help the authorities to decide the vessel movement in the area. Automatic weather station at Zirku Airport to monitor weather data to help Air Traffic Control (ATC) manage the take-off and landing of different flights and helicopters at the airport. The parameters measured at the airport are precipitation, wind speed and direction, humidity and air temperature, air pressure installed on a special 10m mast with support guides. It also boasts a visibility and present weather sensor, a critical requisite for any airport. Automatic weather station at Zirku Offshore Repeater Tower to monitor weather data. It also includes a Doppler current and wave monitoring system installed on the seabed. The parameters measured at the Offshore Repeater Tower include wind speed, wind direction, humidity, air temperature, air pressure and precipitation. This station is also equipped with microwave radar which measures wave heights, wave period and tide. An acoustic wave and current monitoring system is installed under water, at a depth of approximately 20 m on seabed and about 20 m away from the main platform to provide real-time data of current speed and direction at different depth levels, and information on the surface waves. The data from each station is first received at the respective workstations installed at the Jetty Supervisor Office, Air Traffic Control Office and the Radio Room in the Radio Room Building, and stored at the centralized server installed in the Zirku exchange building. The Zirku Jetty and Zirku Airport data is transmitted to this location via fiber optic cables whereas, while data from the Offshore Repeater tower is transmitted through a wireless microwave link. The stored data can be accessed from various workstations through the island's Ethernet, using client software or through a web interface. The data can be further processed by the server and reports can be generated as required. Commenting on the project, Mohamed Fiazi ZADCO OS Manager, Zakum Development Co said, "Meteorological-Oceanographic System plays an instrumental role in providing crucial forecasts directly affecting the plans of any aviator or a sailor. Without these forecasts, travelling by sea or air can be at high risk due to unfavourable weather conditions. The more weather data available to air and vessel traffic controllers, the quicker they are able to create solutions for difficult, weather-based issues. We are happy to have commissioned this significant project to such trustworthy company like Unique Maritime Group; its vast experience in the industry made the Meteorological-Oceanographic System a real success". "Automated airport weather stations have become the backbone for air or marine travel preparation, and they are becoming increasingly prevalent worldwide due to their efficiency and cost-savings", said Ian Huggins General Manager of Unique System FZE. "We are very proud of this state-of-the-art system built by UMG engineers, evidence of the group's expertise in providing tailor made and innovative solutions to fulfil our customer needs"